Two Charles Sturt University (CSU) students with a passion for the beef industry are set to take part in an internship program offered by Angus Australia and the Graham Centre for Agricultural Innovation. Mr Michael van Diggelen and Miss Rebecca Dean were selected from 18 high-standard applicants to be awarded $5,000 internships, co-funded by the organisations. Mr van Diggelen (pictured left), from Mudgee in NSW, is a third-year CSU Bachelor of Veterinary Science/Bachelor of Veterinary Biology student. 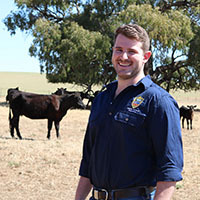 Throughout his studies, Mr van Diggelen has gained experience across various aspects of beef production, working with Angus seedstock producers and commercial beef producers. He is also currently President of the Veterinary Student Association at CSU. 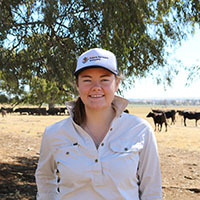 Miss Dean (pictured below), from Euroa in Victoria, is in her second year studying a Bachelor of Agricultural Science at CSU and her interest in the beef industry began on the family farm. Miss Dean spent six weeks in the United States earlier this year, attending Texas Tech University where she worked on Australian research in meat laboratories. She also coached the CSU team for the Intercollegiate Meat Judging Competition (ICMJ). Miss Dean aims to continue her studies at CSU to complete her honours in 2020. The joint program between the Graham Centre and Angus Australia allows the interns to be involved in the CSU co-operator herd as part of the Angus Sire Benchmarking Program (ASBP). The interns will engage in the program by assisting with the artificial insemination (AI) of the CSU co-operator Angus herd and collecting calving details. They will also have a short-term placement at Angus Australia, and will be involved in major events such as the 2019 Angus Youth National Roundup and the 2019 Angus National Conference. The project uses the CSU herd for cutting-edge genetics research through generating progeny test data on modern Angus Bulls. It generates data for the validation and refinement of Angus BREEDPLAN, and works to build a comprehensive phenotype and genotype Angus reference population for genetic analysis and cutting-edge research and development. Angus Australia Strategic Projects Manager Mr Christian Duff looks forward to working with both interns over the next 14 months. “It is great to see such a high level of interest in the internship this year, and we look forward to having the two successful applicants, Michael and Rebecca, working with us over the course of 2018 and 2019,” Mr Duff said. The interns will get their first taste of the program in late October assisting with the AI of the cattle in the CSU herd.